Greece is one of the most popular tourist destinations in the world. Between gorgeous beaches, numerous islands, charming towns and ancient ruins, there are many places in Greece that you need to visit. Greece is a country known for its beauty. It has a coastline overlooking three seas: Ionian, Aegean and the Mediterranean. Greece is famous for its numerous islands, most of which are popular tourist destinations. Another great aspect of Greece is its history. Ancient Greece is famed for its monuments, such as temples, theatres and oracles. There are numerous ruins from the antiquity that you can visit during your stay in Greece. Islands. Islands are among the most beautiful places in Greece. Almost all of Greek islands are inhabited and offer some form of accommodation for tourists. Some of the Greek islands are among the most popular tourist destinations in the world. Islands offer everything: great beaches, charming towns and stunning nature. Beaches. Greece is famous for its seas and beaches. Some of the most beautiful beaches can be found on islands, but do not ignore those on the mainland. 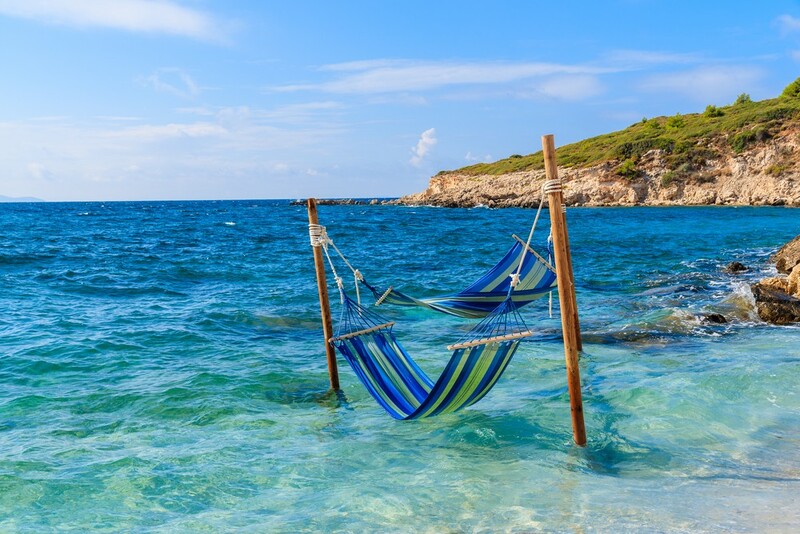 Greece offers numerous types of beaches, from those covered in soft sand to smooth pebble beaches, so there is something for everyone. Towns. There are many small towns known for their charm and beauty. That being said, do not ignore bigger cities, such as Athens and Thessaloniki: they have a lot to offer to the visitors. Those who like European towns will sure like to explore what Greece has to offer. Archeological sites. Greece is famous for its ancient towns and other archaeological sites. If you like Ancient Greece you should visit at least some of the popular archaeological places. Most of them come from the period between 5th and 4th century BC, but there are those from the other eras. Speaking of which, Greek history covers a lot more than just the antiquity so there are many medieval towns and historical places from the other periods that are also worth visiting. Among numerous interesting sites in the country, there are some must-see places in Greece that you need to visit during your travels. These beautiful and exciting destinations are either the most popular in Greece or are hidden gems waiting to be discovered. Santorini (Thera) is one of the most beautiful islands in the world. Located in the Cyclades, this stunning island is the number one place to visit in Greece. The island is of volcanic origin, which shapes its incredible landscape. Do not expect an empty wasteland – on the contrary, Santorini is a lively and charming place you will enjoy. Santorini is known for its charming towns built along the edge of a cliff overlooking the deep sea. The sea beneath the cliff is actually part of the volcanic caldera, since Santorini as it exists today was a product of a strong volcanic eruption in the antiquity. Today, this is a peaceful, beautiful island full of luxurious accommodation for the visitors. Those interested in the volcanic landscapes will sure enjoy the famous black sand beaches on the south and east of the island. 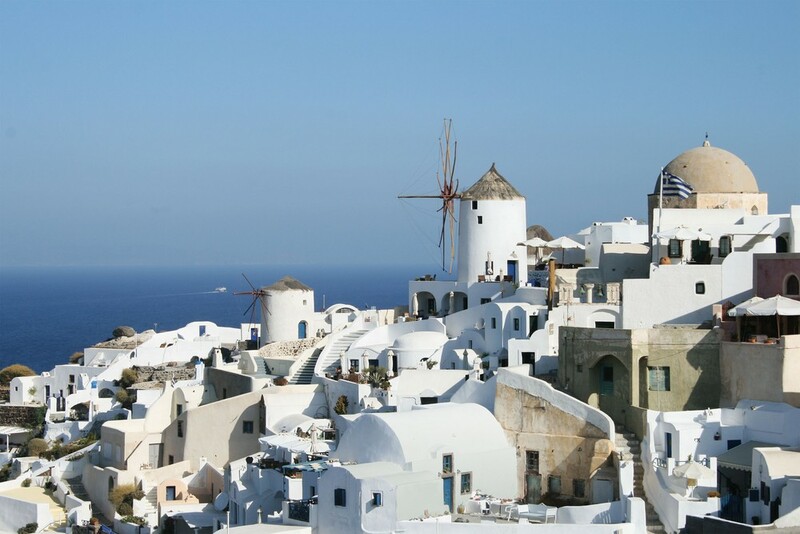 During your visit to Santorini, make sure to go to the capital, Fira. 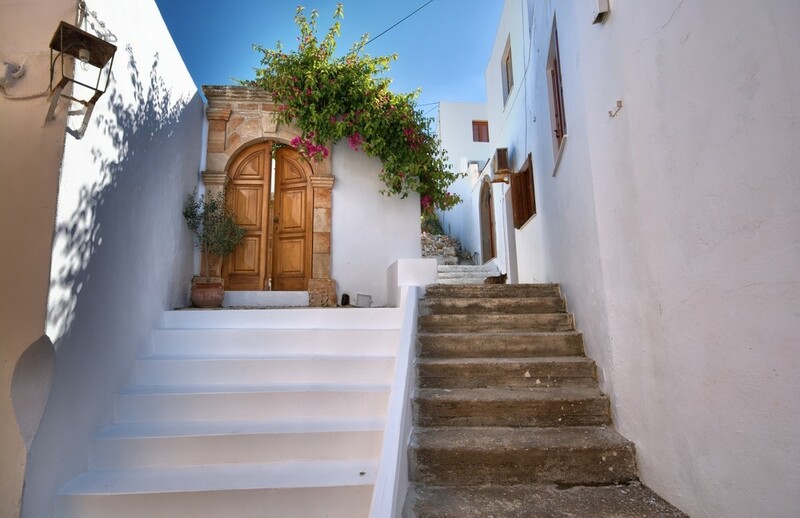 You will be amazed by its white cobblestone streets and an adorable combination of Cycladic and Venetian architecture. The town itself is built on the edge of a 400 meter high cliff, which allows for stunning views of the Mediterranean. The Acropolis of Athens is probably the most recognizable place in Greece. It is so famed that many people think of it when the word “acropolis” is mentioned, even though the word simply means a settlement on top of an elevation. The Acropolis of Athens was a political, spiritual and social centre of the Ancient Greece in its classical period, around the 5th century BC. This powerful city-state shaped history in numerous of ways. The Acropolis of Athens is considered not only a symbol of Ancient Greece but that of the Western civilization as a whole. It is therefore not surprising that it makes one of the must-see places in Greece for many people. When visiting the Acropolis of Athens, don’t forget to go to the Parthenon. This temple was dedicated to the goddess Athena, the protector of the city of Athens. During your visit, make sure to also go to the other temples, the Ancient Agora and other sites on the Acropolis. Mykonos is one of Greece’s most popular tourist destinations. This island in the Cyclades is known for its beautiful beaches and charming towns, so it should be on your list of must-see places in Greece. Mykonos is often considered the most glamorous of all Greek islands, and for a reason. This is a great place for those who like to visit beaches by day and clubs by night. The island has many beautiful sand beaches and it’s popular among international celebrities. 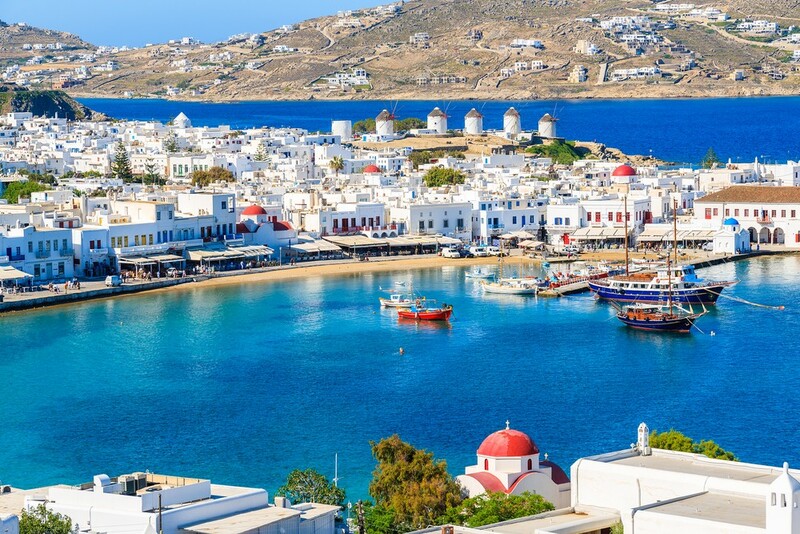 Mykonos Town (Chora) is one of the most beautiful Greek towns, with its narrow streets and gorgeous sandy beaches. This is also a great spot for those looking for exciting night life: there are many clubs and bars you can visit well after the midnight. Lindos is a beautiful medieval village situated on the island of Rhodes. It is famous for its network of narrow streets and whitewashed houses. This is a true gem for all the travelers who like to explore old towns. The village itself has only around seven hundred inhabitants, and they tend to be outnumbered during the summer season by thousands of tourists interested in this charming village. Lindos is also famous for its acropolis which offers stunning views of the sea and the harbour underneath. This beautiful village is also a good place for those who like swimming and sunbathing. There are two great beaches in the near proximity. Lindos beach and Saint Pauls beach are only a short stroll away from the center of the village. Delphi is situated on the slopes of the Mount Parnassus. This is a UNESCO World Heritage Site famous for its ancient oracle. This was one of the most important places in all of Ancient Greece and the surrounding cultures in antiquity. Delphi is the home to the oracle of Apollo that many people used to visit in ancient times in hopes of receiving help and support. Today, Delphi is one of the most popular tourist destinations in Greece. 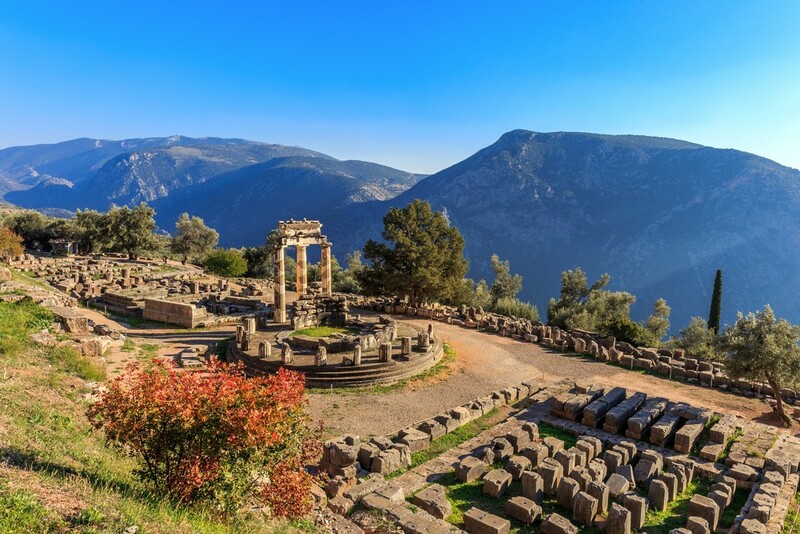 You can visit not only the place of the ancient oracle but also the famous Delphi theatre. The theatre was built in the 4th century BC and could accommodate 5,000 spectators. 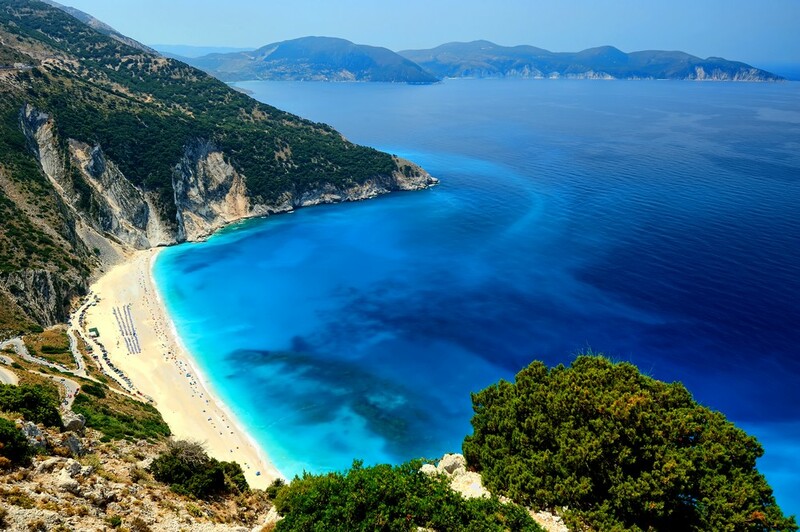 Myrtos Beach, located on the island of Kefalonia, is considered one of the most beautiful beaches in Greece. It is famous for its smooth white pebbles and turquoise colour of the sea. While there may be people who prefer sand beaches, Myrtos Beach can satisfy visitors of all tastes. The colors of the sea, tall cliffs behind the beach and stunning views make Myrtos Beach one of the must-see places in Greece. The entire island of Kefalonia is a real treat for the travelers, so make sure to visit this Ionian island and enjoy its beauty. Have a relaxing time at the Myrtos Beach and enjoy the sun and the sea in the best way imaginable. Samariá Gorge is a canyon located on the island of Crete. Crete is known as one of the most beautiful islands in the world, so it is not surprising that it’s so popular among tourists. Gorgeous beaches, tall mountains, archaeological sites, charming villages – all of this makes Crete an irresistible destination. 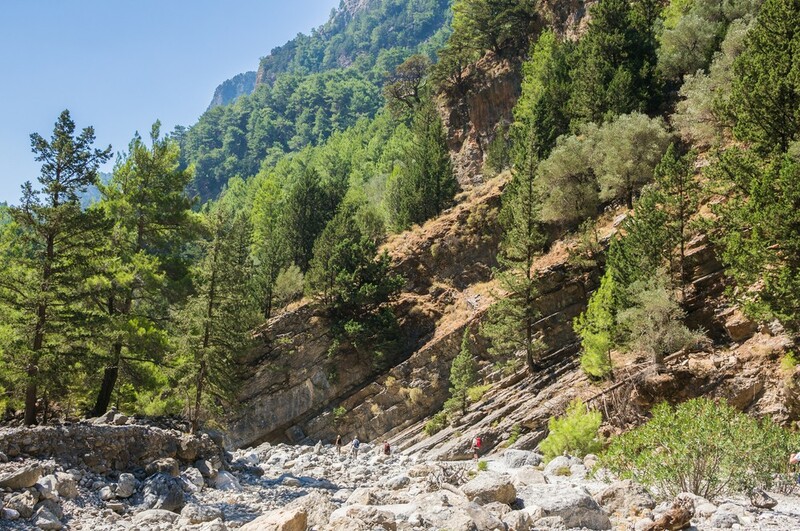 Among all beautiful places in Crete, the Samariá Gorge is a perfect spot for the adventurous. This is a perfect place for those who like adventure and appreciate a more active holiday experience. The gorge is 16 kilometers long and narrow – only 4 meters wide at the narrowest point. It starts at the Omalos and it goes all the way down to Agia Roumeli on the Lybian Sea. There is a popular walking track many tourists take. The whole canyon takes between 5 and 7 hours to walk. This is an adventurous hiking tour that goes through many of the Crete’s most exciting landscapes. 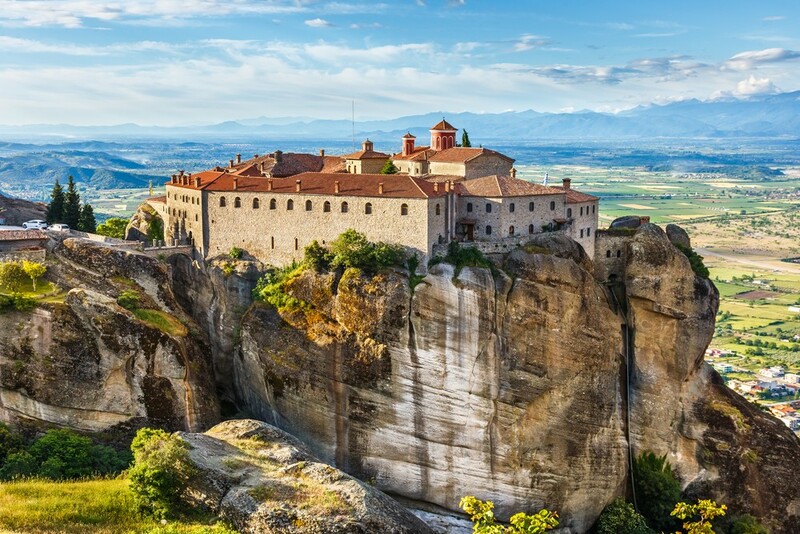 Meteora is a group of 6 monasteries located on the tops of the cliffs overlooking the Thessaly Plain. The name literally means “suspended in the air”. Meteora is a UNESCO World Heritage site. The first of the monasteries was built in the 14th century and all 6 are built in a way that is difficult to access. Traditionally, the only way to access the monasteries was through the long ladders or large nets. Today, there are also stone steps carved into the rocks but the access to the monasteries is still difficult. Meteora is one of the most unusual places in all of Greece and definitely a site you need to visit during your travels. Mount Athos is a beautiful region in Greece known for its monasteries. This is the name of the mountain and a peninsula in northern Greece. 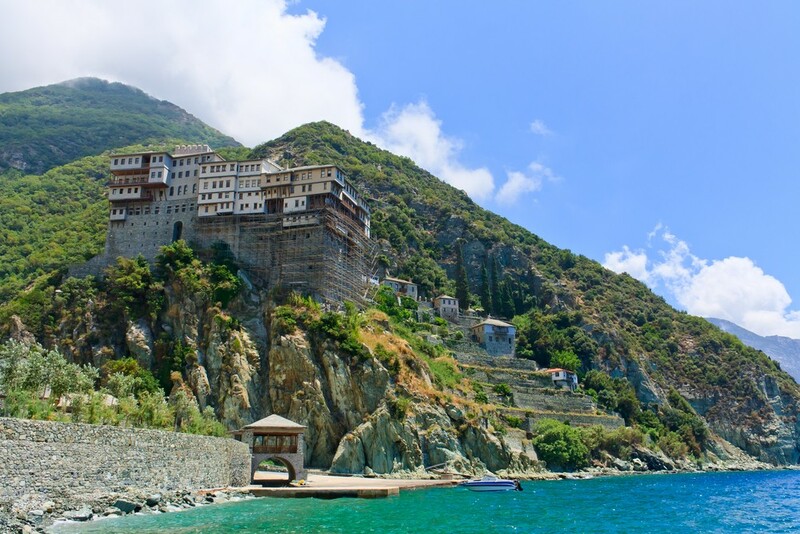 Mount Athos is a spiritual centre and a home to 20 Eastern Orthodox monasteries. All but three monasteries are Greek, while one is Russian, one is Serbian and one is Bulgarian. The mountain is dedicated to the Holy Mother of God and the most of the inhabitants of the area are the monks – there are around 1,700 monks living in Mount Athos. Mount Athos is actually an autonomous state in Greece, and it’s treated with utmost respect. It is also important to note that only men are allowed to visit Mount Athos, so keep this in mind when you organize your travel. Mystras is a site located near ancient Sparta, in the Peloponnesus. This UNESCO World Heritage site was the capital of the Peloponnesus in the 14th and 15th centuries. It remained inhabited throughout the Ottoman period after the 15th century but it was abandoned in the 19th century. Today, only the medieval ruins remain to testify of this once powerful city. The ruins and the surrounding landscape provide a stunning view to all the visitors. Mystras is a great place for those who like medieval sites and ruins. 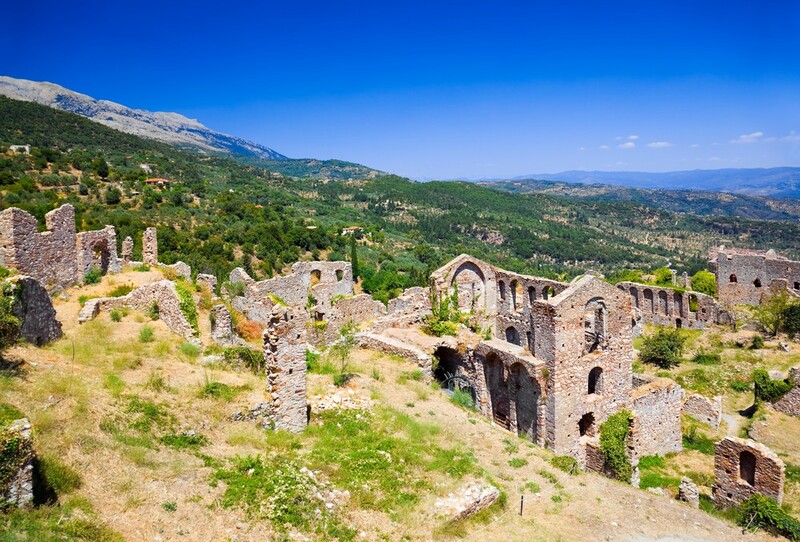 While most of the popular ruins in Greece come from the antiquity, Mystras offers something different. Rhodes is an island in the Aegean Sea, situated close to Turkey. The island is popular among tourists from all over the world. One of the most beautiful places on the island is the Rhodes Town, a UNESCO World Heritage site. 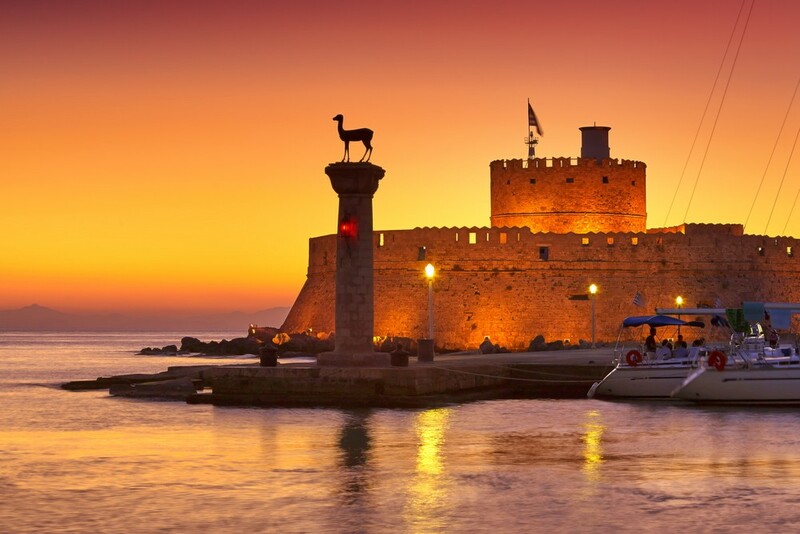 Rhodes Town is famous for its powerful fortification system and monumental towers. The fortification was built in the 14th century by the Knights of St. John. Many of the city’s streets are car-free so this is a great destination for those who like to explore on foot. You can enjoy numerous beaches nearby, as well as a charming village of Lindos, which is another one of the must-see places in Greece mentioned on this list. Corfu Town is one of the most popular tourist destinations in Greece. 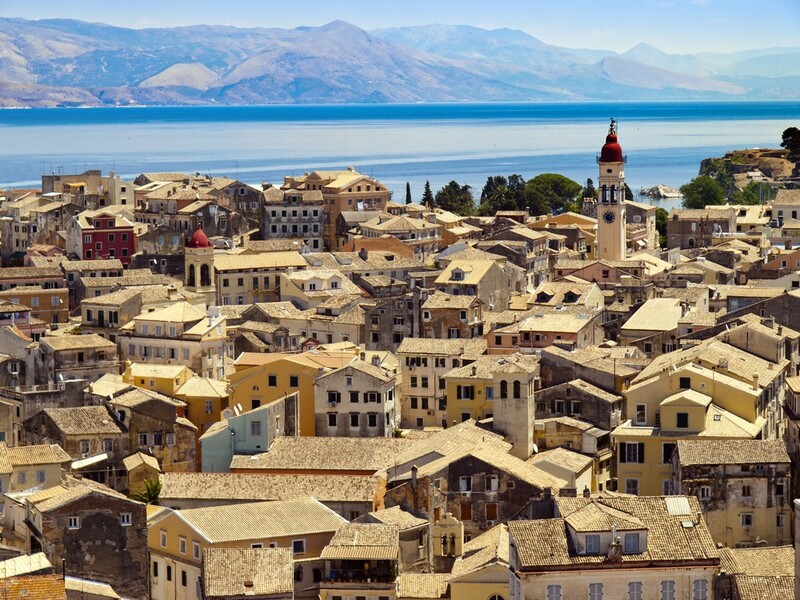 Located on the Corfu island in the Ionian Sea, this charming town is known for its architecture and history. The island was rules by Venetians for several centuries, which resulted in beautiful Venetian architecture all over Corfu Town. A UNESCO World Heritage site, the town is also famous for two 16th century fortresses and numerous car-free streets. This is also a perfect base for exploring the island of Corfu and all the other islands of the Ionian Sea. You can rent a boat to the nearby sites as well as the mainland. This makes Corfu a great place to explore the entire area. Thessaloniki (Salonica) is the second-largest city in Greece, after Athens. Situated in northern Greece and overlooking the Aegean Sea, this is a popular tourist destination famous for its architecture and history. Thessaloniki is known as a bordering place where numerous cultures mix ever since the antiquity. The main attraction in Thessaloniki are Byzantine churches, as well as Roman monuments, such as Triumphal Arch of Galerius and the Rotunda. You should also visit the White Tower built near the sea. 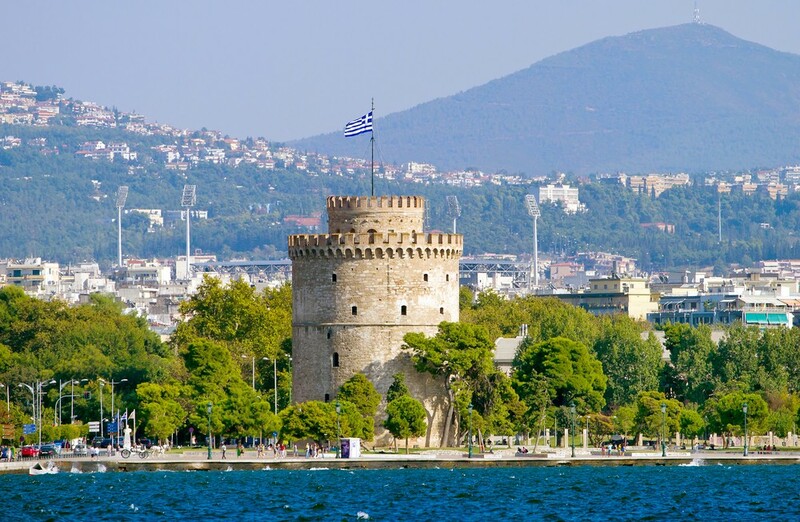 This high tower, built in the 15th century, makes one of the most popular attractions in Thessaloniki. The city itself has a lot to offer to many different types of visitors. Nafplio is one of the most beautiful cities in Greece. Situated on the Argolic Gulf on the Peloponnese, it is a charming spot for those looking for a luxurious, yet calming holiday destination. The city was an important centre in the early 19th century: it was the first capital of modern Greece before Athens took over. 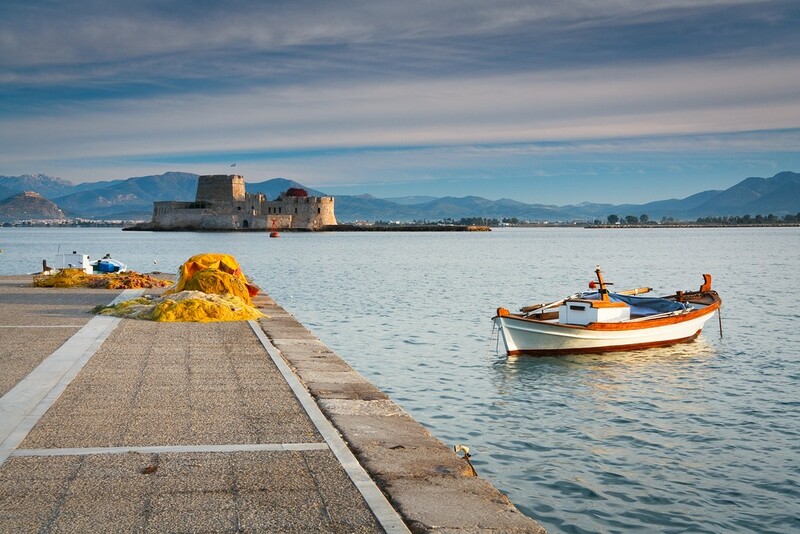 Nafplio is famous for its Venetian architecture and numerous neo-classical mansions. 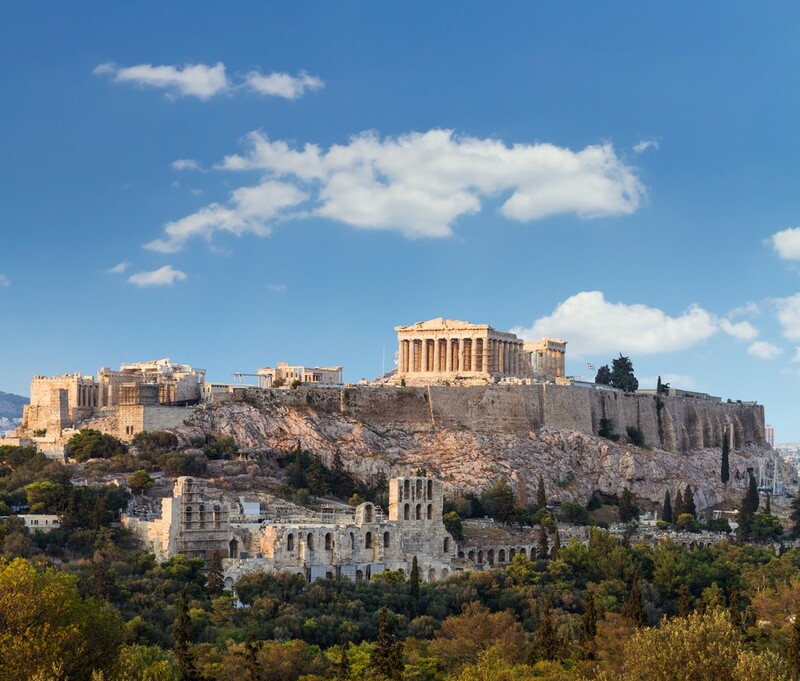 When you are in the city, make sure to visit the old town, the Syntagma Square and the Palamidi Castle. The Palamidi Castle is built on a hill so you need to take 999 steps carved into the rock to get to the top. The town is popular among couples because it is called “the most romantic city in Greece”. It is also known as a car-free town, so keep this in mind if you wish to visit this beautiful city. Greece is more than just gorgeous beaches and charming towns. A lot of it is hidden in the middle of the Greek mainland. There are many exciting destinations that are not present on the usual tourist maps but still make a great experience. Those with adventurous spirit who are looking for something different will love the stone villages of Zagorohoria. Located among the Pindus Mountains in the Epirus region of the north-west Greece, this area is famous for its stunning landscapes. 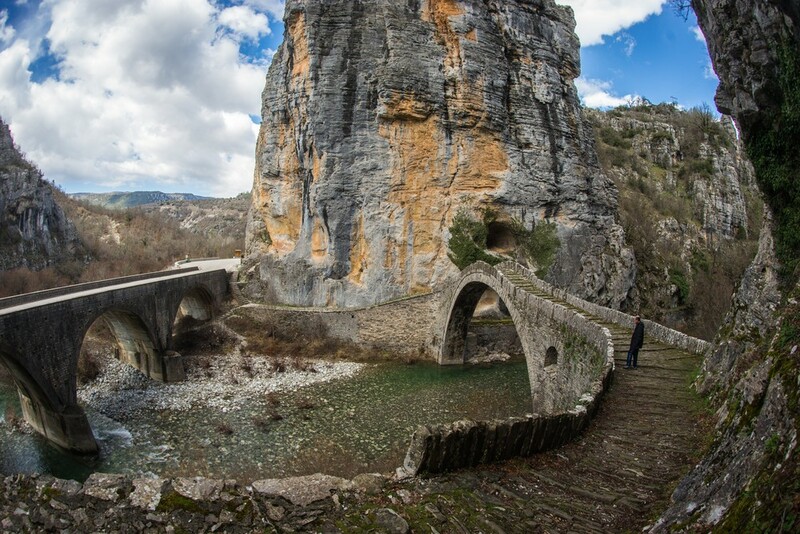 The mountainous terrain is home to numerous old stone villages and impressive bridges. Stone buildings lost in the green and brown landscape – this is a sight you need to experience for yourself. The region is a great place for hiking but some other activities are also popular, such as mountain biking. This is a great place for those who like mystery and adventure.